Digital imaging function such as capture, analysis, and database formation-are growing faster than ever before. The LV100DA motorized system addresses to these demands and now comes with a mechanism that automatically optimizes observation technique and illumination and these settings can be controlled from external devices. 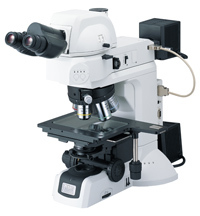 The newly designed LV-S32 3x2 is a compact stage for industrial microscopes. Its triple-plate design ensures durability,stability and ease of use,even when heavy samples such as metallic materiasls are observed. Observation with first-order red compensator,UV polarizing,and epi-fluorescence observation with UV excitation,in addition to brightfield,darkfield,DIC,simple polarizing,epi-fluorescence(excitation using visible light) and donble-beam interferometry are all possible. Although the LV-LH50PC Precentered Lamphouse is 12V-50W, the brightness is equivalent to or higher than that of 12V-100W. The eco glass used in the CFI LU Plan Fluor and L Plan EPI CR series does not contain harmful substances such as lead and arsenic.